The 858 Professional Sample Processor is a flexible sample changer that is geared entirely to your requirements. It can be operated together with all analytical systems based on the Professional IC family. 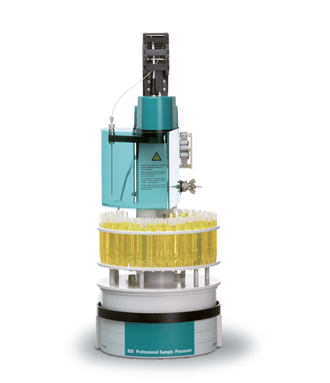 The 858 Professional Sample Processor processes samples from 500 µL to 500 mL. The sample transfer takes place either by means of a peristaltic pump on the 850 Professional IC system or with an 800 Dosino. The 858 Professional Sample Processor can be equipped with a variety of sample racks. A large number of sample racks are available which can hold between 12 and 148 sample vessels. The 858 Professional Sample Processor can actuate up to 999 sample positions. The possibility also exists of moving to an external position, e.g. for dilutions. This professional sample changer provides connectors for two membrane pumps and three MSB devices, e.g. the 800 Dosino or the 801 Magnetic Stirrer. The sample rack and the sample vessels with stoppers are included among the optional accessories of the 858 Professional Sample Processor in order to guarantee flexibility when selecting the optimum combination. MagIC Net™ software is required for the operation of the 858 Professional Sample Processor. The sample processor has the same capabilities but a built in peristaltic pump performs the sample transfer. Automated ultrafiltration of the sample is possible before injection. A large number of sample racks are available which can hold between 12 and 148 sample vessels. The 858 Professional Sample Processor – Pump can actuate up to 999 sample positions. This also covers the possibility of moving to an external position, e.g. for dilutions. This professional sample changer provides connectors for two membrane pumps and three MSB devices, e.g. the 800 Dosino or the 801 Magnetic Stirrer. The sample rack and the sample vessels with stoppers are included among the optional accessories of the 858 Professional Sample Processor – Pump in order to guarantee flexibility when selecting the optimum combination. MagIC Net™ software is required for the operation of the 858 Professional Sample Processor – Pump. The sample processor has a built in peristaltic pump and an injection valve. The configuration allows various sample preparations such as ultrafiltration, dilution, preconcentration, matrix elimination etc. A large number of sample racks are available which can hold between 12 and 148 sample vessels. 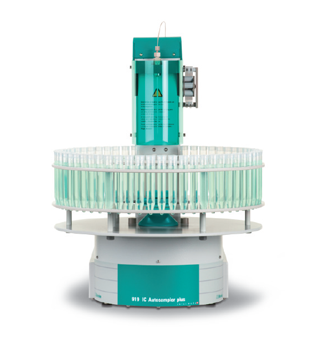 The 858 Professional Sample Processor – Pump – Injector can actuate up to 999 sample positions. The possibility also exists of moving to an external position, e.g. for dilutions. 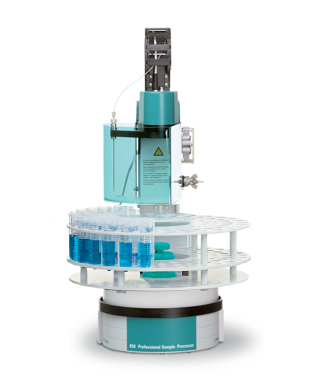 This professional sample changer is equipped with a six-way injection valve, e.g. for sample preparation, and provides connectors for two membrane pumps and three MSB devices, e.g. the 800 Dosino or the 801 Magnetic Stirrer. The sample rack and the sample vessels with stoppers are included among the optional accessories of the Professional Sample Processor in order to guarantee flexibility when selecting the optimum combination. MagIC Net™ software is required for the operation of the 858 Professional Sample Processor – Pump – Injector. The 919 IC Autosampler plus is the ideal solution for simple automation tasks. Combined with the instruments from the Professional IC family it enables sample transfer as well as frequently used inline sample preparation steps such as Inline Ultrafiltration. The 919 IC Autosampler plus fulfills the requirements of laboratories with medium sample numbers. It enables automation of the full range of Metrohm IC instruments. 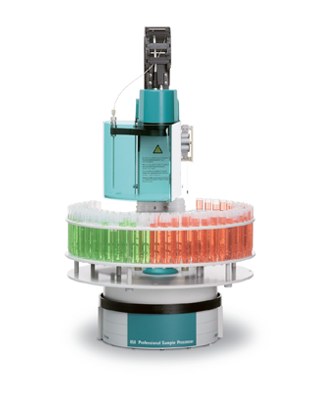 The 919 IC Autosampler plus is equipped with a sample rack which accommodates 56 sample positions. Sample volumes between 0.5 and 11 mL can be processed. The complete sample path is metal-free and equipped with a zirconium oxide sample tube with an extremely high lifetime. The 919 IC Autosampler is suited for determinations in the trace analysis range up to analyses of aggressive main components. In addition, thanks to its dual-channel peristaltic pump, it can be equipped at any time with Inline Ultrafiltration or other inline sample preparation techniques. The 919 IC Autosampler plus is controlled by MagIC Net™.